Recalls, advisories, media releases, deal sheets, order forms. Pharmacy is one of the few industries where fax still works. We'll blast out a text message to your list of subscribers via our SMS platform. Or talk to us about list-building ideas. We can broadcast a fancy email or a plain email announcement to your opt-in email list. No email list? Come talk with us. Can we interest you in a package deal? 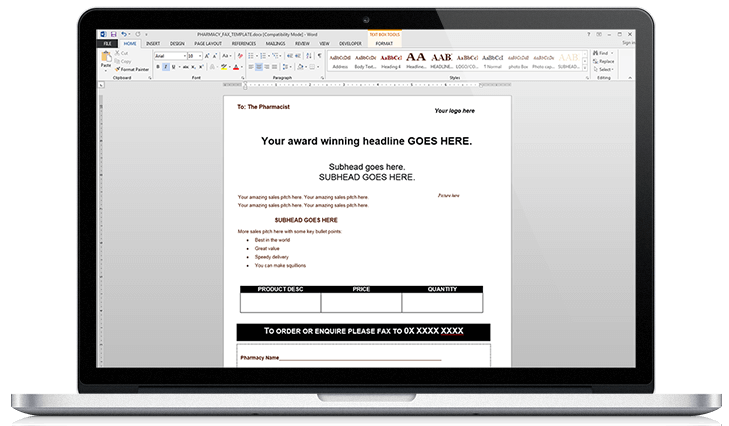 Download our free FAX template! Don't have a clue when it comes to designing a page for a faxout? Or simply don't have the time? We have created a fax template specifically designed for a faxout to retail pharmacies, that you can download for free and edit as you please. It contains boxes for you to put your product details and wholesaler/product codes, plus a faxback form, which we have found tend to work well when faxing to busy pharmacists. But you can add or delete or reformat to suit your layout. Interested in a fax to pharmacies? If you need more information on our fax campaigns, you can view our Pricing & Info page. Otherwise, please don't hesitate to Contact Us if you have any queries. We can fax your document to chemists/pharmacies nationally or by State or banner group. We can also broadcast an email or text message to your opt-in lists. This is handy if you sell over-the-counter products as you can blast a fax to pharmacies then promote to consumers and encourage them to visit their local pharmacist for the products. Everyone wins! And it is very cheap, direct, and responsive marketing!